Since 1845: How many jockey & horse injuries & deaths at The Garrison? During a recently called media conference Superstar Bajan jockey Patrick Husbands stated his opinion that the track at The Garrison is “too small”. Husbands stated that the track is dangerous and some jockeys refuse to ride there because of this. Now folks, Mr. Husbands is probably one of the best jockeys that Barbados has produced in the past 150 years or so – so we should listen carefully when he speaks. But we should also be aware that Mr. Husbands might not have come forward with this statement on his own and that there might be other agendas afoot from the same bunch of elites that were just given $19 million in public funds by the Thompson DLP government. -How many jockey and horse injuries and deaths have happened at the Garrison since racing began there in 1845? -How many jockey and horse injuries and deaths in the last ten years? Five years? -How many are attributable to the “small” track as opposed to the nature of horse racing itself? -How does the rate of horse & jockey injuries at The Garrison compare with other tracks worldwide? We look forward to hearing from Patrick Husbands and the Barbados Turf Club on this point. 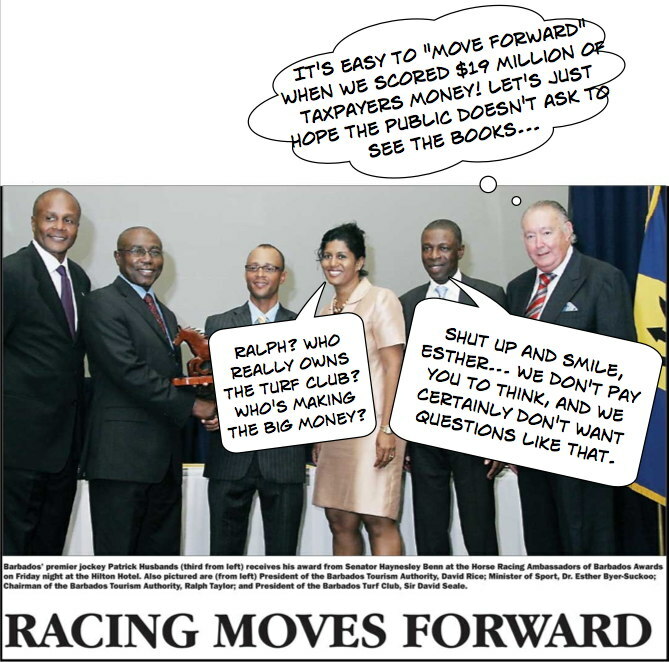 Not one more dollar of public money until the Barbados Turf Club is fully accountable for its operations and finances. You want public money for your race horse operations? Then open the books for public scrutiny and we mean the lottery operations too. According to Husbands, most of these jockeys said they felt the Garrison track was “too dangerous”. 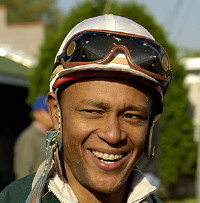 Sorry to be a grouch, but did someone erase the outstanding records of both Venice Richards and “Chally” Jones, both of whom were Champion jockeys in their times for many years (and with the last 150 years) – and across the Caribbean, not just on the Bimshire Rock? A single opinion does not a conclusion make. I think you should have a consensus and the willing names of several prominent jockeys (and trainers who used to be jockeys) before hanging out such a large sign. I’m not for or against the Turf Club, just seeking balance. Unlike Sparrow, because Husbands may have said so, don’t mean it is so!! I will grant that horse racing is a fairly tight community and that repercussions may be feared, but I think wider sources are appropriate here. Point taken about Venice especially. If Clive doesn’t mind I’ll change the article to say that Patrick Husbands is “one of”. What husbands say might be true.but the question is where is the money going to come from? This comment by Mr Husbands leaves some unanswered questions for me and I totally agree with BFP’s opening comment. Many of the sports top riders would never venture here simply because the purses are way too small. Surfing also suffers from this fact. If it is so dangerous why was he drunk when he rode the Gold Cup? Everyone at the garrison knows this. I don’t know about him being dunk. Husbands is a class rider, but that is where it ends. He has limited knowledge about the marketing and sales side of racing. Horse racing is no longer just for the elite, about 50% of the owners are average income owners, that race on a tight budget. I certainly am not wealthy, and have the pleasure of owning a couple horses. I know of only two deaths as a result of falls at the garrison in a race, and one resulting in paralysis, leading to a premature death sometime later after, due to an accident at exercise. I have been involved in horse racing at various levels for over 25 years. There are inherent dangers in racing. Jockeys here do not get injured here any more frequently than at other racetracks around the globe. North American jockeys are used to riding on tracks with log stretches and wide radius turns. That is why they do not want to ride on the small Garrison track with its small radius turns. It would be unwise to risk injury in Barbados when you are making a half a million or more per year in North America. Patrick will continue to be a Star jockey at Woodbine and I will continue to enjoy watching him and the other bajan jockeys like Jones and Callaghan. There is also the up and coming Terry Husbands following in the footsteps of his uncle. Barbados (in Horse racing) is well represented in Canada. Horse racing has its risks but so do many other things. BFP, i submitted this comment a week ago to the Nation but they refused to print it. I asked how come there was a 100,000.dollar reward out for info into the running of last years Gold Cup? Is the Turf Club saying that there is a criminal element among the racing in Barbados? Also nice to know how broke they are and have to be bailed by Government and could give away that kind of money just like that.This is a cold case? They had a chance to fix it a year ago. Why now? If any wrong doing was done, BTC look among you.You know the usual suspects. Bookies etc. That ad is not by the BTC. Amazing millions spent on Kensington .. bajans happy, write off a bad debt for horse racing.. and it is a problem.Horse racing employs more people in Barbados than any other sport, it may employ more than half the sports in Barbados combined. We don’t have betting on local racing by bookies, so there was nothing to gain by the local bookies. I guess the elite would be the grooms, general workers, trainers, jockeys and other tradesmen/professionals that make a living in the racing industry. @ Racer. So you are telling me that people involved in the BTC put up that money and the ad. If they got that kind of money why then not put it to a worthy cause like towards the debt, or maybe a jockey school? The part about bookies went right over your head. Smell the coffee my friend. The BTC had nothing to do with the ad. Any individual may place an ad in the newspaper, it may have been placed by a disgruntled punter for all I know/ care. When you find out who placed the ad, why don’t you call them and tell them how to spend their money. I am going to go on a gut feeling here and say that you know who put out the ad. You also seem to know a lot about the goings on in the BTC. You also know enough to question Mr.Husbands knowledge about marketing and sales, but you dont know he rode the race drunk, when it was the topic all around Barbados. You need to be up front and dont be afraid to say what you know.You said he was a class rider. Did he show class after the race? If Husbands was drunk, why wasn’t be charged with impaired riding? Folks I just couldn’t help it. Can u prove that when Patrick Husbands rode in The Sandy Lane Gold Cup he was under the influence of alcohol? u like u is another 1 u could prove that de man was drunk? stupseeeeee. And yes he got class but sweetheart he aint no different from we he aint perfect & what ever was his actions on that day he won The Gold Cup he rite dis is his home dats just how wanna dose wanna drag down Rhianna but sweetheart if he could give his self a name @ age 16 when he won the prestigious cockspur why he can’t come & enjoy he self & have lil fun when he won the Sandy Lane Gold Cup in 2010.
u really wat de bajans answer dat wa ya done know how dem dose tlk, “da aint gine do he nothin caw he Patrick Husbands”, ” he mussy get charge but na body aint know” lol it’s so sad when it comes 2 our own ppl.